yey... i finally got my loot. though the package arrived more than a week ago, mom made me wait until i go home for the holidays before i can get my hands on this. (hmp, that was torture mom! 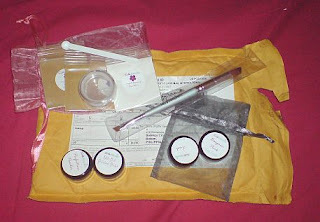 ehhee) i got the foundation sample kit where i got the samples of their 3 colors to be mixed with their white foundation, samples of their perfecting powder and the dual-ended eye brush. they even included 2 generous amount of e/s samples in my 2 fave shades...pink and green. haven't got the chance to mix the foundation shades yet and try the rest of the items yet...will post a review soon once i get the chance. ngarag pa lola nyo sa paglilipat this week.